Pink Milk: Happy, Scrappy, Go! Hello, hello! I'm so sorry I'm a day later than planned. This post has taken a lot longer to write than I anticipated plus we seem to suddenly be in the midst of a flurry of house-viewings. Nope, we've still not sold - one lady definitely wants it but has a house to sell and a couple of others are very tempted and have gone off to "have a think". Pffft. Anyway, back to happy scrappy news. I've swapped two of the colours! Once I'd added the gorgeous raspberry, I decided that the clotted cream and peach melba weren't sitting right with me - they were in conflict with the silver - so I removed them both and included a white instead. Suddenly my palette is popping and looking less pastel. I'm liking it very much though. I've generated a new random stripe (it's a 3 x repeat) which I shall just use as a guide (starting from the top) and am all set. I'm delighted you love the link to the stripe generator, it's great isn't it? Remember, this project is very unplanned so it's still forming in my head. 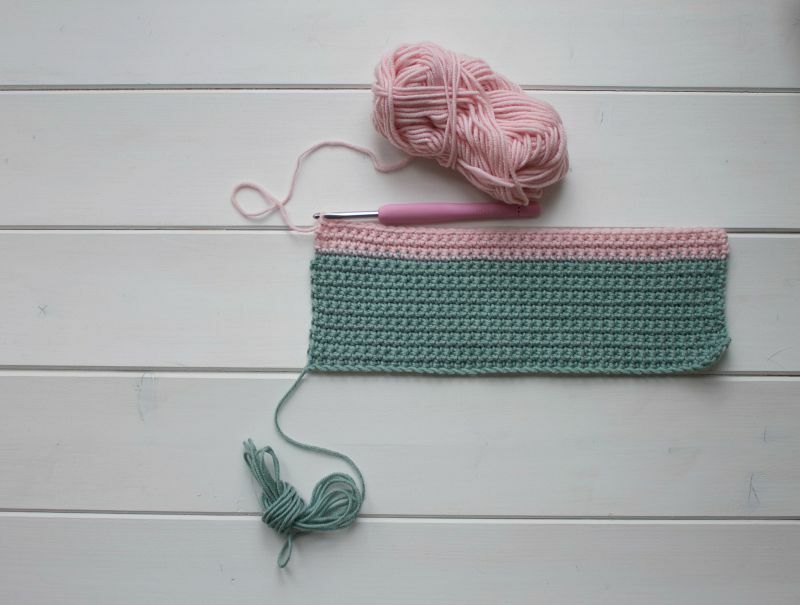 One thing I have decided to do is to begin and end my scarf with a large stripe (15 rows) in the duck egg. I think it will set the other stripes off nicely and, given my love for embellishments, I'm having ideas of adorning it with flowers or bordering it with coloured tassels. We shall see. You will notice from the picture below that I have left a rather long beginning tail of yarn. It's a couple of metres long, loosely knotted to prevent it from getting in the way. I often do this as a 'keeping my options open' measure. If I later decide to add another row or trim for whatever reason, I have the yarn attached and ready to use. That, my friends, is forward planning! 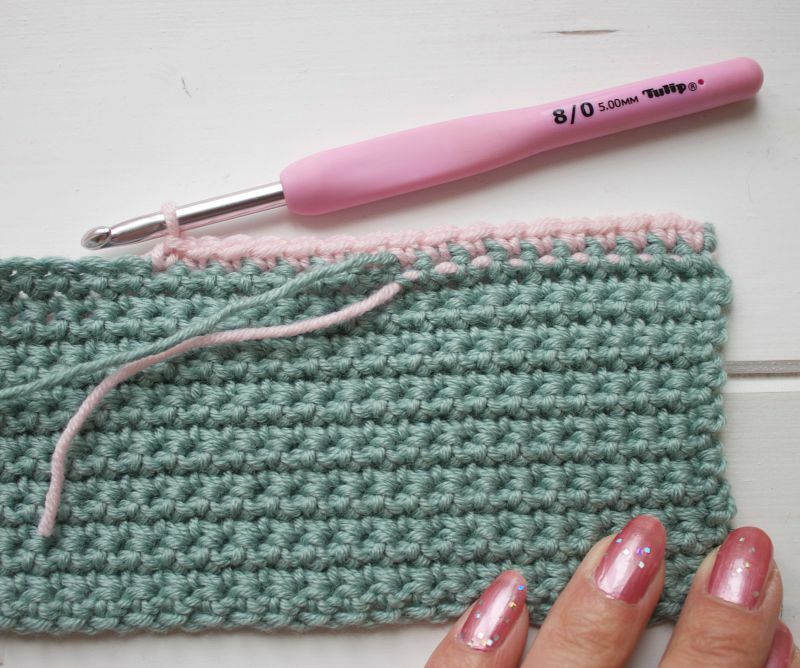 I have chosen to make my Happy Scrappy Scarf using purely double crochet (or single crochet in US terms). I know a few people will throw their hands up in horror but, trust me, there is method in my madness. 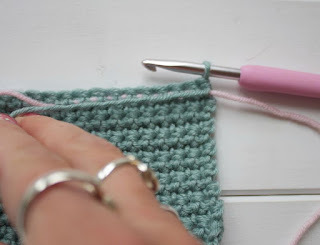 I'm a huge fan of the humble double crochet, (I chatted about it here). I find it extremely relaxing and actually the quickest of the stitches. Despite a hook size of 3.25mm being recommended for my yarn, I'm actually using a 5mm. Remember, the size stated on the yarn band is purely a guide. 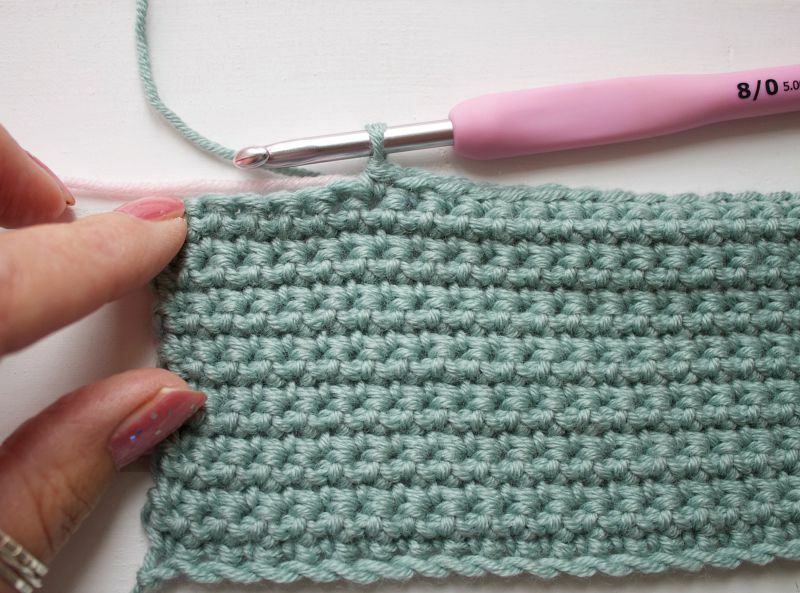 You can get some really interesting results using bigger hook sizes, particularly with double crochet. As you increase your hook size, so the density of the fabric you create changes. I know from experience that using a 5mm hook with Debbie Bliss Baby Cashmerino produces the loveliest soft drape, particularly after the project has been blocked. 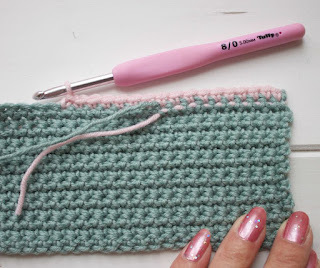 If you're using a double knit weight yarn with a recommended hook size of 4mm, I would urge you to try using a 5mm or even a 5.5mm if, like me you're a tight crocheter, and see for yourself. Plus, of course, it works up a lot quicker which is always a bonus! To begin my scarf, I made a chain of 41 with a 5.5mm hook. 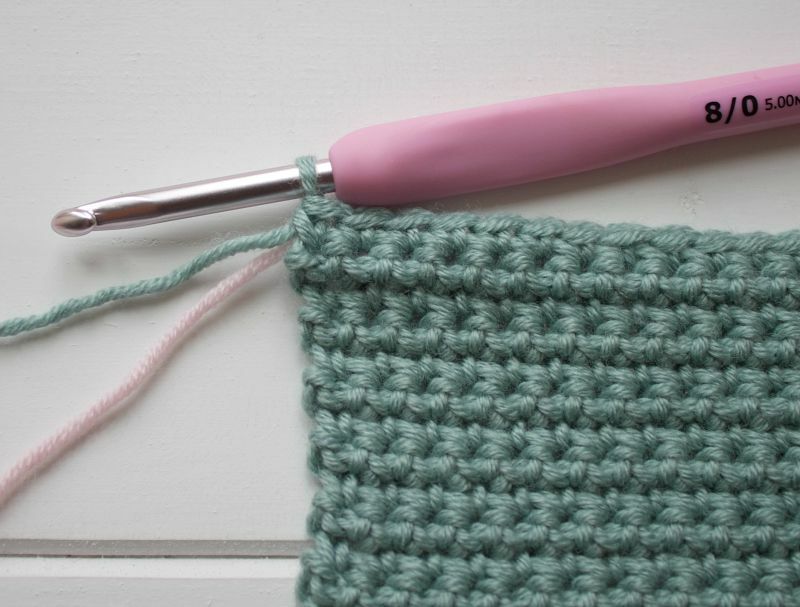 This will create a scarf width of approximately 24cm or 9.5". If my beginning chain is to be part of a straight edge, I ALWAYS use a larger hook. Your tension naturally relaxes throughout a project so this prevents any annoying 'curvage'! Swapping back to my 5mm and starting in the second chain from the hook, I simply double crocheted in each chain, going through one loop of each chain with my hook only. I find this creates more of a definite and secure edge than going through two loops. 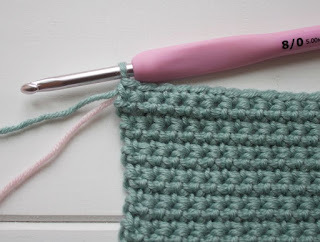 Once at the end, I turned, chained one and continued to double crochet. That's all there is to it. 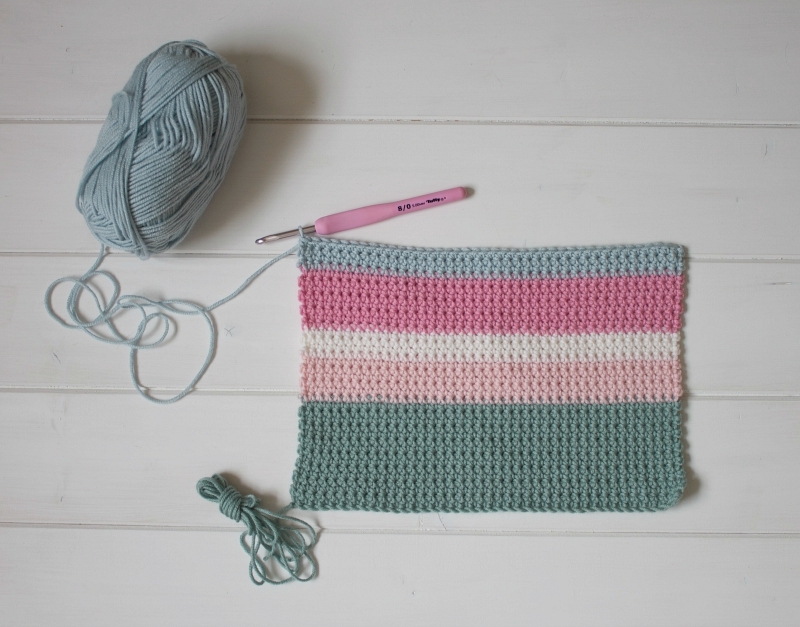 I have tried every method of changing yarn colours conceivable and personally favour this way for stripes. 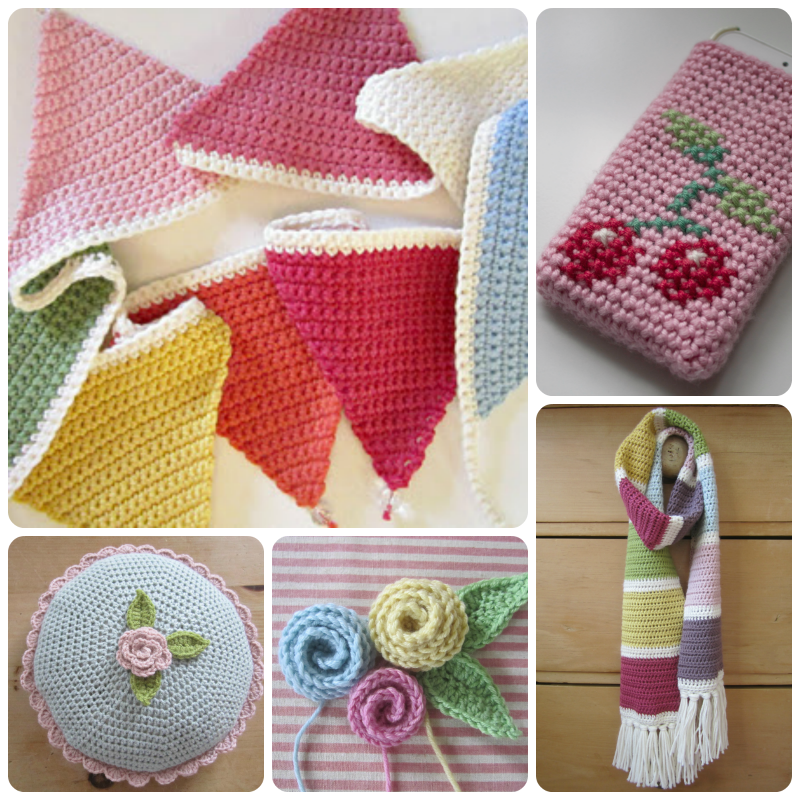 I am a huge advocate for crocheting in yarn ends as I go and doing it as neatly as possible. However, I don't like to crochet-in both the end tail of one colour yarn and the beginning tail of the next at the same time. 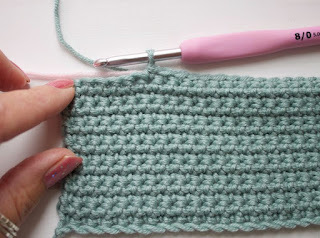 I find it creates a bit of a ridge and changes the appearance of the stitches slightly. 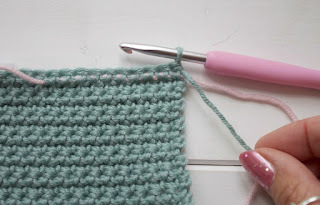 With the right side of your crochet facing you (beginning tail will be to the bottom left) and approximately ten or so stitches from the end of the row, lie the new colour of yarn along the top of your stitches and crochet over it. Bring the working yarn across your crochet and along the front of your stitches. 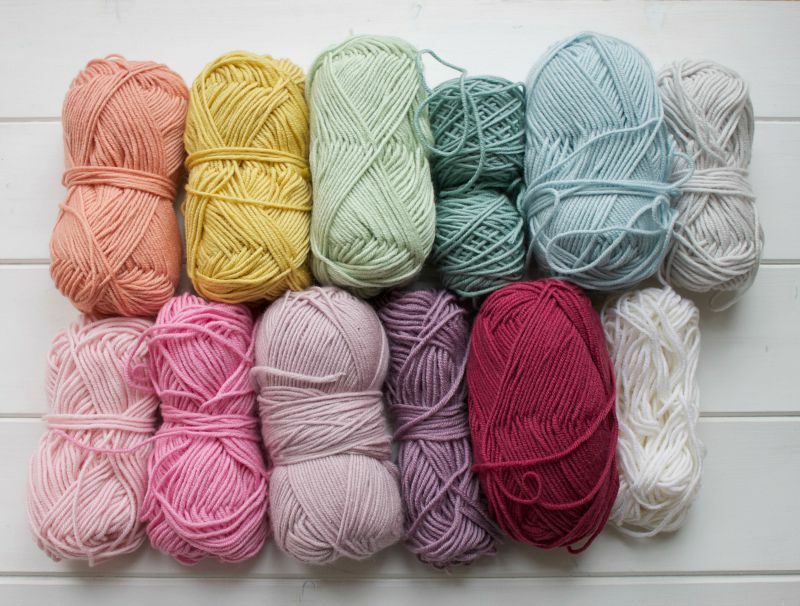 Remove your hook and pull up a loop of the new coloured yarn. In the new colour, chain one and then continue to double crochet over the tail of the previous colour for ten or so stitches. Gently pulling both tails will neaten them up. Leave a little length in them - we'll finish them off properly after blocking. I do hope that's clear. It sounds a lot more of a faff than it actually is, I promise. 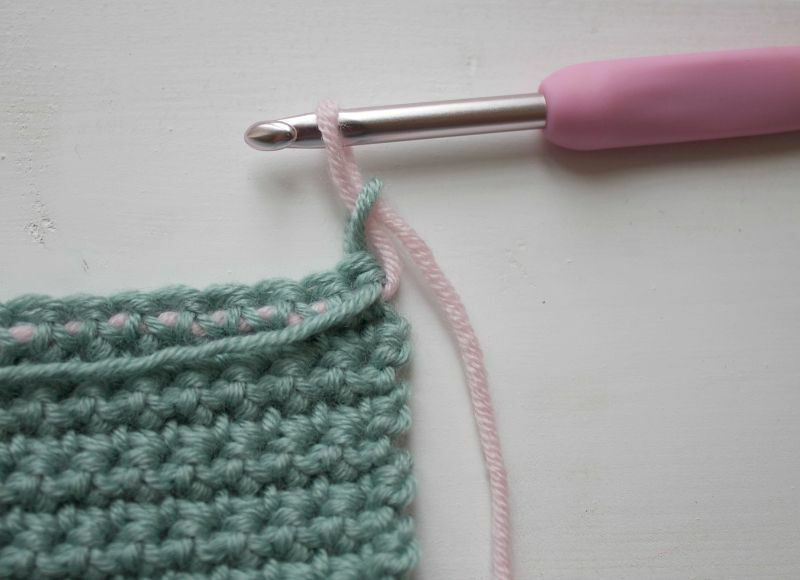 Don't forget it also avoids any lengthy sewing-in business at the end of your project! This is far as I've currently got. I think it's fair to say that I'm still very much in my comfort zone colourwise! Very soon though, the green, lilac and apricot will start creeping in. Eep! I'm now off to make a cup of tea, put my feet up and carry on hooking. I'll keep you posted with my progress. 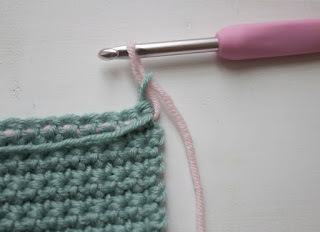 If you are making your own Happy Scrappy Scarf, I'd love to see how you get on too. If you're on Facebook, please feel free to post any pictures on my feed. If you're on Instagram, perhaps you can hashtag your make with 'happyscrappyseptember' or 'happyscrappyscarf' so I can see it? Otherwise, there's good old email! With your permission, I'd love to include any photographs on a future blog post. If I've forgotten anything, I'll be sure to pop straight back. As ever, do let me know if you have any comments or questions. I love these colours! They are going to be a beautiful blanket. Hope your house sells soon. Have a wonderful day! So far so good I think. The colours all go well together and you've definitely made a good start. Not only is this beautiful but can you hear me cheering over your method of dealing with thread tails?! I will be using your method as I hate working in tails after a project is complete. Yuck. Now with your way of taking care of them as you go, it makes more sense and looks good too. Win, win! Thanks so much for sharing. Aren't house buyers annoying, especially the 'thinkers'. They get your hopes up, thinking they might come back,when actually they are just being polite and don't want to tell you what they really think of the place. We've been on the market for a year (in NZ) and I'd really love to sell soon. I'm getting fed up of waiting to come home to cold, overcrowded UK - no place like home! Such lovely colours! With so many I would need a guide in order not to make myself crazy with indecision. I never would have thought about Random Generator, but there you have it! Good luck with the house: it's frustrating I know. Utterly gorgeous! I love the 'popping' palette, it certainly works for me. Really good joining technique too, I like it! PS Hope the house goes soon, they're all hanging around a bit at the moment aren't they?